Ingredients: Other Ingredients: Citric Acid, Natural Artificial Lemonade Flavor, Acesulfame Potassium, Silicon Dioxide and Sucralose. Energy & Antioxidant Flood Complex (Inosine, Gamma-Aminobutyric (GABA), Glucuronolactone, Natural Caffeine, Potassium Gluconate, Cocoa Bean (Extracted for 99% Theobromine), Evodia Rutaecarpa (95 % Evodiamine Extract), L-Norvaline, Sugar Cane (Extracted for 60% Octacosanol), Coenzyme Q10, Vinpocetine, Alpha-Carotene, Zeaxanthin, Cryptoxanthin, Lutein, Folic Acid, Selenium, Huperzia Seratta (Extracted for 99% Huperzine A). Directions: Initial (First Serving) Instructions: To assess your individual tolerance to the energy complex, combine 1/2 scoop of White Flood with 6 - 12 oz. of water and consume it before your workout. Shake well before drinking. Directions for Usage: Combine 2 scoops of White Flood with 16-24 oz. water, and consume it pre-workout and/or during your workout. 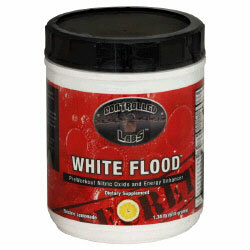 For best results, White Flood should be used in conjunction with other Controlled Lab products, with at least 1-2 gallons of water per day, and a high protein/moderate carbohydrate diet.